Kostroma was founded in 1152 by Prince Yuri Dolgoruky, the same guy who founded Moscow and some towns of the Golden Ring. The pride of Kostroma is the 14th century Monastery of St.Ipaty (the Ipatievsky Monastery) where the Romanovs royal dynasty started. Young noble Mikhail Romanov was in exile in the monastery of St.Ipaty (banished by rivals for the Russian throne) when he was elected tsar in 1613. This marked the end of the Time of Troubles Russia lived through in 1604-1613. In honor of the event all successive Romanov rulers came here to stay at the monastery's red Romanov Chambers. The monastery`s Trinity Cathedral contains over 80 old 17th century frescoes. The bell tower chimes concerts every hour. Behind the monastery is an attractive museum of wooden architecture exhibits peasant houses, windmills and churches built without nails. The grounds are pleasant for strolling. 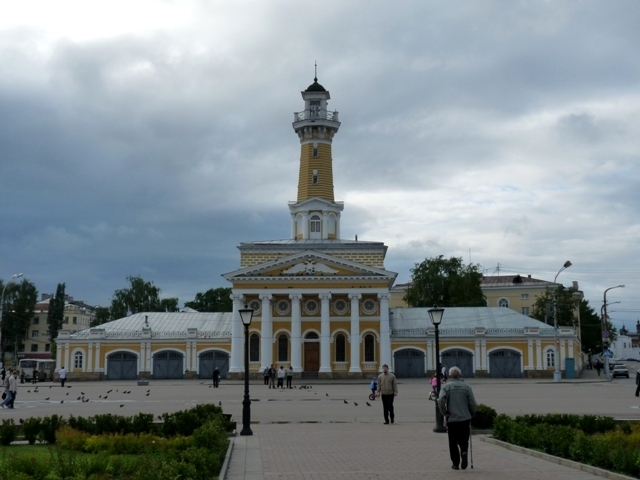 During the Time of Troubles Kostroma was a center of Russian resistance against the Poles. A local peasant named Ivan Susanin deliberately guided a Polish detachment hunting for Mikhail Romanov into a swamp and to their deaths. The delightful historic centre dates back to the 18th century. Collection day for homeless pets.